I originally was using Aveeno Baby Sunblock thinking I was doing the right thing with B. 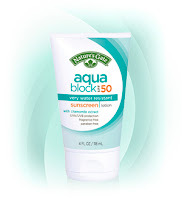 Enter the EWG 2010 Sunscreen Report and I quickly realized that I in fact was exposing B to some nasty chemicals. Selection is limited in Canada so I opted for Natures Gate. I like how it applies easily, lasted a very long time and didn't have a strong odour. It was even cheaper than the Aveeno Baby Sunblock I had originally purchased! The issue with this sunblock is that it contains oxybenzone which is a photocarcinogen and hormone disruptor (studies are mixed though). Now information on the EWG site indicates that this product was reformulated in 2011 and oxybenzone was removed. The rating above is based on it still being in the product so this rating may change next year if in fact the oxybenzone has been removed. The EWG has released the 2011 Sunscreen Report. I encourage you to check it out prior to selecting your sun protection this year. Again I find that the options in Canada are very limited and if you can find something makes the list of 'must buy' it ends up being hella expensive. ** I purchased this product on my own. It was not given to me. How far would you go? ?